Should the Highest Bidder Take the Woman? President Muhammadu Buhari's wife, Aisha Buhari, has called for the education of the girl child to end the menace of child marriage in parts of Nigeria. According to a statement by Suleiman Haruna, her spokesperson, Mrs Buhari, said this on Wednesday while receiving female delegates to the 41st Conference and 73rd Executive Committee Session of the Africa Parliamentary Union who visited her at the State House, Abuja. The delegates were received on behalf of Mrs Buhari by the wife of the Vice President, Dolapo Osinbajo. According to the statement, Mrs Buhari said girls need a healthy and safe transition to adulthood as well as a certain level of maturity and understanding in order to make an informed decision on the choice of a life partner. "Through my Future Assured Programme, I have witnessed firsthand what interrupted childhood could do to the self-esteem of young girls, in some instances, thwarting promising careers," she said. Mrs Buhari furthered spoke on other challenges on marital relationships like complications of childbirth such as VVF, interruption of academic pursuit and curtailment of economic opportunities. She called on the parliamentarians to use their position to articulate measures that will address the issue within cultural sensitivities of our different communities. Mrs Buhari also urged them to consider what form of support and empowerment could be given to girls that are already in these marriages. "Their dreams do not have to end because of the circumstances they have found themselves in," she said. Also at the event, the head of the delegation and Senate President of Zimbabwe, Mabel Chinomona, said women face numerous challenges like lack of political representation, violence, intimidation, early child marriages, and lack of equal opportunities in critical areas. It is therefore important that women meet and share experiences. "Against this background, women parliamentarians must unite and support each other in coming up with strategies and policies that address challenges faced by women together in order to make a difference as we drive for equal opportunities for all." Mrs Chinomona said. "For us parliamentarians, we have a critical role to play as we legislate and provide oversight on government activities. In doing so, we appreciate the support from our mothers, the first ladies, for their activities that seek to empower women," she added. Child marriage remains widespread globally, according to a UN report on "Ending Child Marriage Progress and prospects" in 2013. The report said in Nigeria, more than half of adolescent girls aged 15 to 19 who are currently married have husbands who are 10 or more years older than they are. It also stated that worldwide, more than 700 million women alive today were married before their 18th birthday. More than one in three (about 250 million) entered into the union before age 15. The UN report also said child brides tend to have low levels of education. 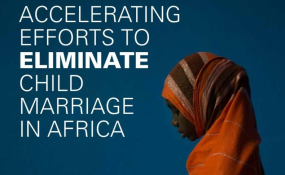 The Federal Ministry of Women Affairs and Social Development in its National Strategic Plan to End Child Marriage in Nigeria in 2016-2021 set the target of ending child marriage in the country by 2030.